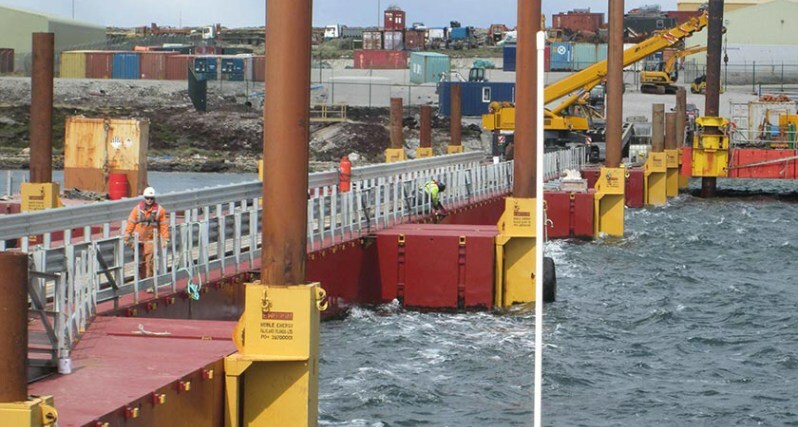 Trant were awarded this contract to install a temporary dock facility in Stanley Harbour to support the client’s exploratory offshore drilling programme. In delivering this project, we were able to combine our marine sector expertise with our significant experience of the logistics required to work in the South Atlantic. 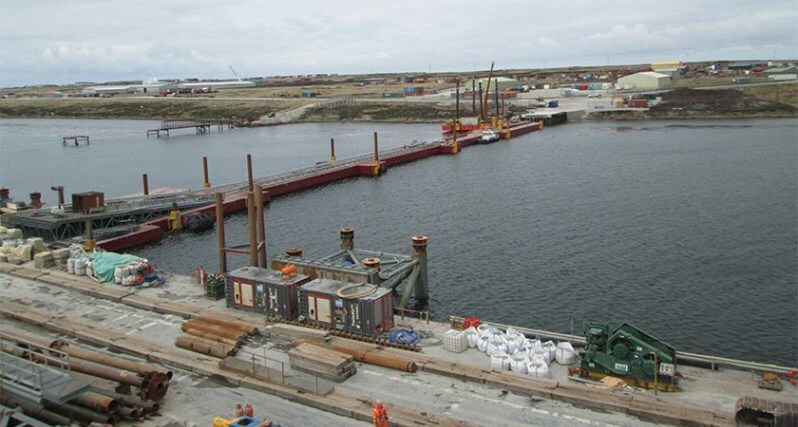 All plant and equipment was transported to the Falkland Islands using an 8,000 tonne barge under tow. A 275 tonne crane and 25 tonne forklift were also purchased in America and delivered to the Falklands on the barge. All remaining construction equipment was shipped from the UK. The barge, measuring 30.5m x 122m, was secured by attaching it to new mooring dolphins with piles and rock anchors installed into the sea floor bedrock. The dolphins were formed using 90 Tn jacket structures prefabricated off site. Initially, the prefabricated jacket structures were lowered to the sea bed. Four tubular piles measuring 1.066m diameter and 25m long, were driven into bedrock through circular sleeves located in the corners of the jacket structure. The jacket was then raised to its final position before drilling a 710mm diameter borehole through the tubular piles and into the bedrock. Rock anchors 50m long by 600mm diameter were then installed to secure the dolphin structures. 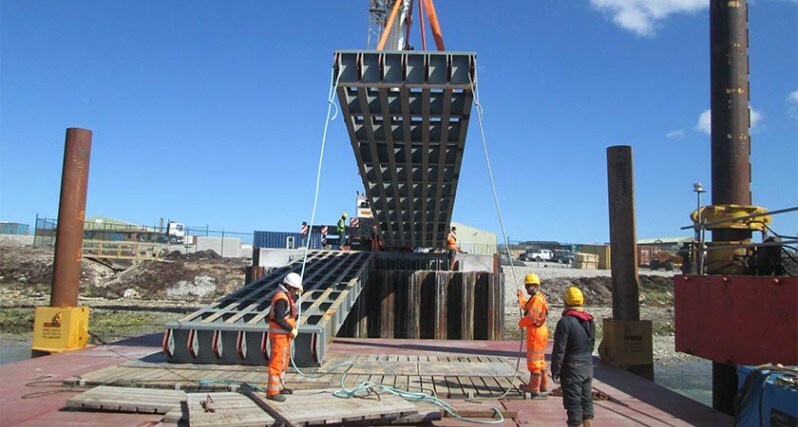 A 250m causeway to provide access from the shore to the barge was constructed using a combination of 6m and 12m long flexifloat barges, secured in position by 600mm diameter tubular piles, 20m long, driven into the bedrock. A sheet piled bankseat structure was designed and constructed on the foreshore with reception and laydown areas. Electrical installation, including back up power system for the on/offshore facilities, completed the project.